There is an old saying about how you can tell the character of a man by the woman he chooses. That could not be truer of Jon and Liz. We first met this amazing couple during their engagement shoot in Littleton. It was our chance to step into their lives and see just how amazing these two people are. You really cannot say enough about how genuine they are and how true their love is for each other. Needless to say, we were definitely looking forward to shooting their Piney River Ranch wedding in the fall! Now, we know how beautiful Piney River Ranch is after shooting there over the past few years. I gotta say though, I am always taken back by the beauty of this landscape. 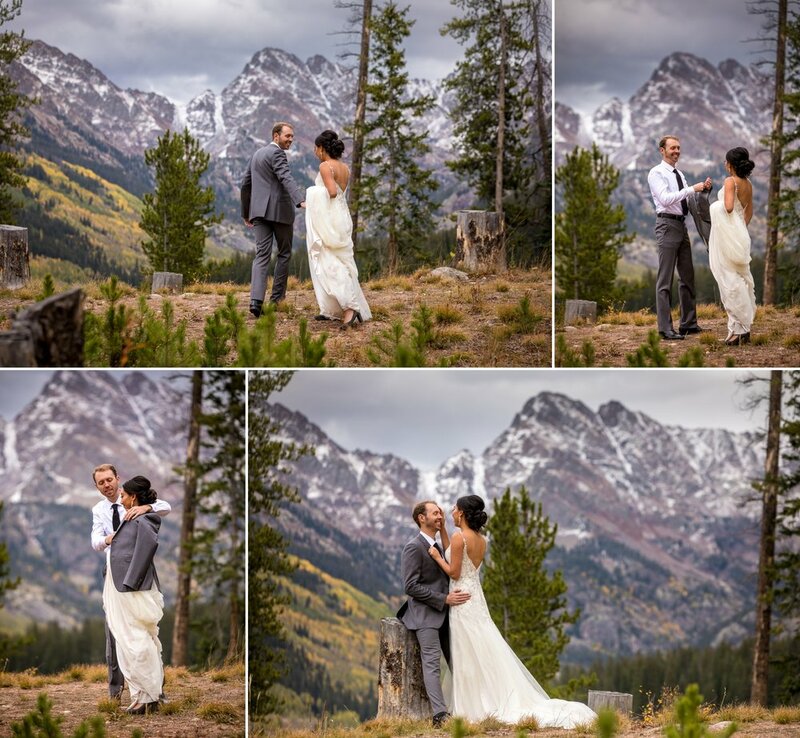 The mountain peaks had just received some of the first snow of the year and coupled with the sun peeking thru the clouds created an ethereal moment during their first look. The purity of their love and excitement was just amazing to sit back and capture. It only got better from there, especially during the ceremony. The snow started to fall and it became this mesmerizing fairytale that words really can describe. We still get goosebumps seeing the photos! The icing on the cake was definitely the alpenglow. Even the staff at Piney River Ranch hadn't seen it like this before. It's rare enough of a phenomenon, but to see it during a wedding just adds to how incredible this day was. Jon and Liz, you truly have something special. It's apparent to all the people you surround yourselves with and we are so honored that we were able to be a part of that. We hope these images bring you back to this day and remind you just how amazing you both are!